An astute Australian audience acknowledges and appreciates Alfa's acclaimed sporting manner which is traditionally delivered in an overt manner. But how does a little Alfa Romeo fit into this scheme of things? Small Alfa Romeos have been a part of automotive history for a very long time. 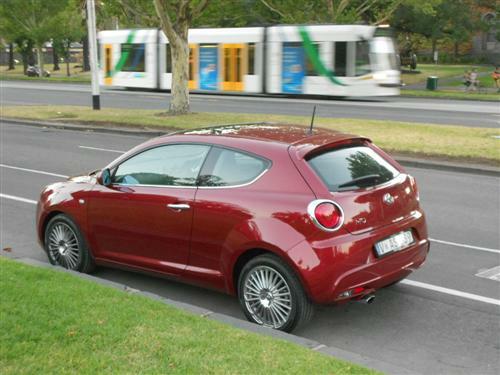 The current small hatchback, the MiTo, has been with us in one form or another since 2008. 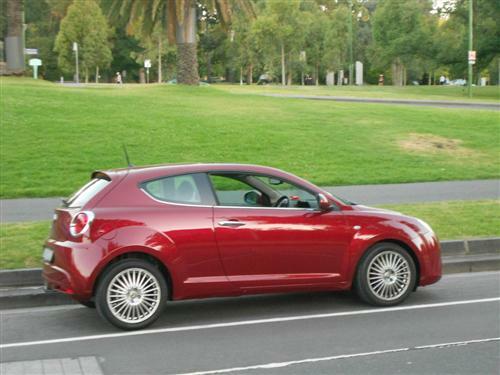 By the way, the name MiTo is a nod to Milano and Torino - Milan and Turin. 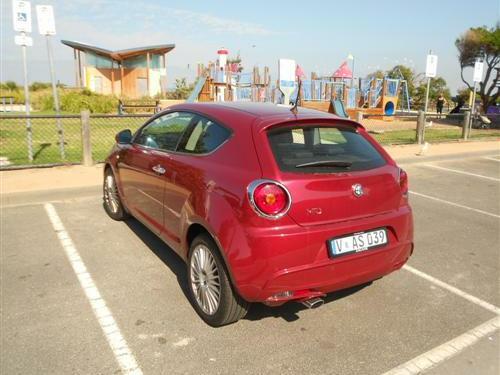 The test car was the Alfa Romeo MiTo Distinctive, the top-of-the-line model, which comes with a 1.4 litre engine and a twin-clutch automated transmission (TCT). It is priced from $28,000*. 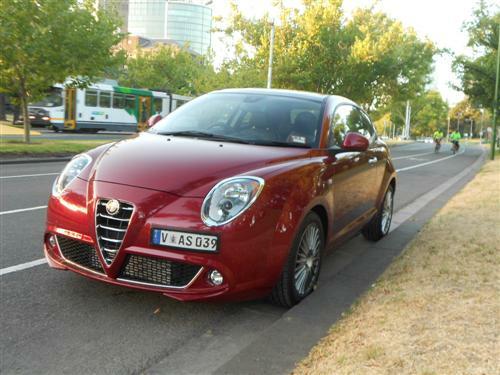 Premium paintwork, such as the red on the test car, adds $500* to the price of the MiTo, taking the as tested price* of our drive car to $28,500*. 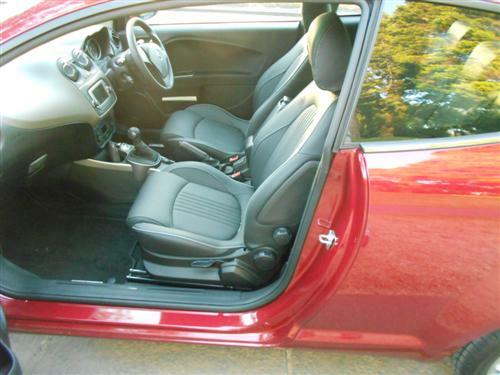 An entry level MiTo with a tiny 875cc engine and manual transmission is available from $22,500*. A 1.4 litre engine comes with the Progression model in both manual and TCT priced from $24,500* and $26,500* respectively. Next model up is the Distinctive which is the subject of our drive as already noted. Expectations of an Alfa for me include a good ride, bordering on firm, and driving dynamics that are nothing short of impressive. With the MiTo, considering it is small enough to be considered as a city car rather than a sports car, I believe it is fair to reduce the expectations a little. 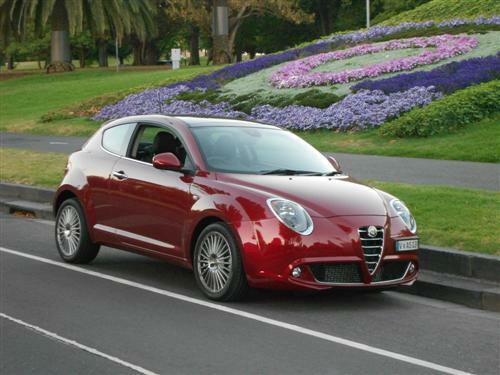 On that basis, I am convinced that the dynamics of the MiTo make for a worthy car. The ride isn't harsh but respectably heading towards firm whilst the steering and braking is very good just as you should expect. However, the automated twin-clutch transmission is somewhat unhappy in my opinion. To be a satisfied driver of the MiTo TCT you do need to be patient to work out how to use the transmission with your driving style. The Next Car team put on 402 kilometres of purely urban driving around Melbourne and it was only towards the end that we finally became accustomed to the transmission. It shouldn't be that difficult! Yes, the turbo lag is evident. This can be improved if you apply a slower depression of the accelerator for a moment or two rather than just 'flooring' the accelerator. Each driver should experiment with the 'dna' selector, which is positioned on the centre console, to find their preferred driving experience. Factory figures indicate the MiTo 1.4 litre can undertake a 0-100km/h dash in 8.2 seconds. Upfront the seating is good and the spaciousness is adequate, definitely not over abundant. 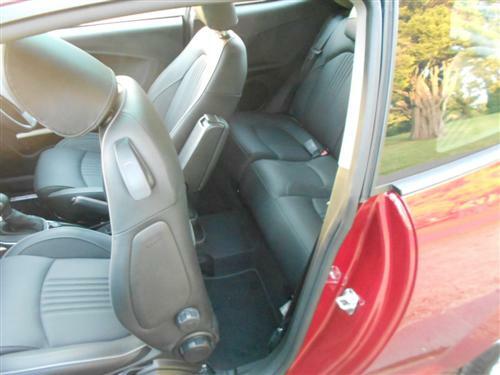 Getting into the back seat is aided by the front seat/s sliding forward but the process of physically getting into the back is probably best left for some-one else (if you know what I mean). The MiTo Distinctive test car came with a 1,368cc 4-cylinder petrol-fuelled turbo-charged engine that drives the front wheels through a six-speed twin-clutch automatic transmission. Maximum power is 99kW at 5,000rpm and maximum torque is 206Nm at 1,750rpm. A stop/start system is fitted, a feature more and more popular these days with European car makers. Steering is rack and pinion with hydraulic power assistance. Turning circle is 11 metres - a good figure. Seventeen-inch alloy wheels are standard on the Distinctive. The spare wheel is of the 'space-saver' variety. Suspension is by Macpherson struts and an anti-roll bar on the Distinctive at the front and it is a torsion beam at the rear. Factory specs indicate the fuel consumption rating is 5.5 litres per 100 kilometres on the combined cycle. City drivers may be more interested in the urban cycle which has a rating of 7.1 litres per 100 kilometres. 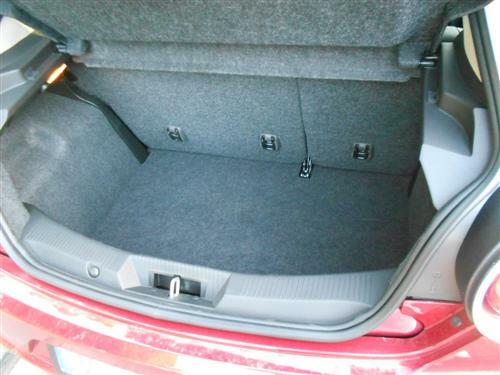 The fuel tank capacity is 45 litres. All Alfa Romeo petrol-engined models require premium unleaded 95RON fuel as a minimum. E10 is unsuitable. Standard: 5-inch colour touchscreen, Bluetooth hands free phone connectivity, Bluetooth audio streaming, AM/FM radio, single-disc CD player, USB and AUX for portable compatible devices. Standard: seven airbags; ESP - which is known as Vehicle Dynamic Control (VDC) at Alfa; anti-lock braking system (ABS) incorporating Electronic Brake force Distribution (EBD); traction control and more. MiTo has a five star crash worthiness rating from EuroNCAP. MiTo can haul a braked trailer (and load) up to 500kg. An unbraked trailer up to 400kg is OK. Appropriate towing equipment is required. MiTo comes with a three-year/150,000km warranty (conditions apply). Roadside assistance is included for three years (conditions apply). Alfa Romeo's little MiTo is well equipped in the Distinctive model and the branding implies a worthy heritage is behind the car. But the turbo lag and gearbox means that you need to get used to this nice looking small car before you can appreciate its hidden qualities. It shouldn't be this difficult to enjoy a car with such a pedigree. However, using what Alfa Romeo call the "dna" - a variable driving mode - in the dynamic choice offers the better driving experience.